Mr. Bamberger worked for Siemens AG in the field of mobile telephone systems for three years after completing his studies of mechanical engineering at the University of Hannover. During this time, he worked as a project manager for product development, i.a. in Japan. In 1995, Mr. Bamberger started to work in the field of protection of intellectual property as a patent attorney trainee. 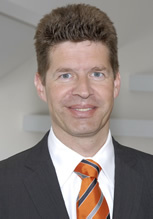 He joined the Hamburg office in 1998 and became a partner in the partnership in 2000. He is a licensed representative before all German and European patent, trademark and design offices (GPTO, Patent Appeal Court, EPO, WIPO, EUIPO). Mr. Bamberger's work is principally focused on preparing, defending and enforcing national and international registrations of technical inventions and developments, including related infringement actions and expert opinions in legal and technical IP matters as well as problems arising from the German Employee-Invention Act. Mr. Bamberger especially attends to mandates in the technical fields of mechanical engineering, particularly machine tools, special purpose machines, automation technology, materials science, medical and orthopaedic technology as well as packaging technology.